The Ultimate Vision Board Party! Name: The Ultimate Vision Board Party! 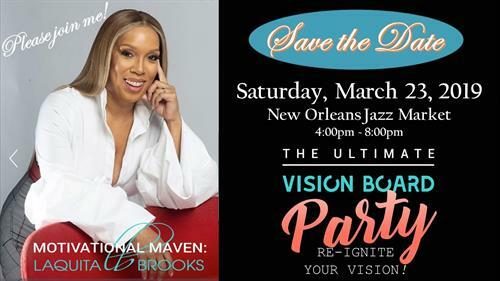 “The Ultimate Vision Board Party” brings together women around the city of diverse demographics and ethnicities, creating a safe space to activate their dreams and goals that may have been tossed aside for a variety of reasons that challenge women. They are offered an atmosphere of inspiration and focus in order to clearly outline their vision through a fun step by step process, while receiving much needed support and accountability.